FILE - Alleged victims of repression attend public hearings in Rabat of the Moroccan Equity and Reconciliation Commission, Dec. 21, 2004. The hearings gave a platform to victims of human rights abuses dating back decades. The trauma of war cannot easily be forgotten; the atrocities committed during the conflict can not easily be forgiven. Yet both actions are necessary for a nation and its people to move beyond the violence. In an effort to repair social fabric torn by years of strife, many communities have turned to truth-and-reconciliation commissions. These forums give victims of violence a chance to be heard and perpetrators an opportunity to seek forgiveness from their neighbors. Some two dozen truth-and-reconciliation programs have taken place in countries wearied and traumatized by years of civil war. The first were in Latin America. Perhaps the most famous ones were held in South Africa after the end of apartheid. Such a truth-and-reconciliation process is taking place in the West African nation of Sierra Leone, which experienced a violent civil war from 1991 to 2002. 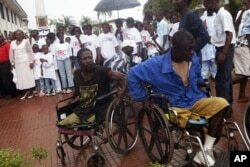 FILE - Two war victims seen in wheelchairs at the launch of Liberia's Truth and Reconciliation Commission in Monrovia, June 22, 2006. An accounting of atrocities committed during nearly a quarter-century was aimed at setting the stage for a long-term peace. During the Revolutionary United Front’s campaign against the government, more than 50,000 people were killed, thousands more were raped or had limbs amputated, and 2.6 million people -- more than half of the population -- were displaced. In 2007, a Sierra Leonean nonprofit group, Fambul Tok, or "Family Talk" in the Krio language of Sierra Leone, began a reconciliation program to give civilians a chance to recount their experiences in sometimes chilling detail. Perpetrators were able to ask for forgiveness without fear of prosecution. In many cases, the process has had positive results. Oeindrila Dube, a professor of politics and economics at New York University, saw the effect on victims who end up forgiving their aggressors and rebuilding the community. But Dube suspected not everyone benefited fully. Perhaps there were some who found the process of coming face to face with perpetrators revived memories of wartime trauma, worsening anxiety and depression. Supported by the World Bank, Georgetown University and the NGO Innovations for Poverty Action, Dube and her colleagues studied truth panels to find out. A decade after Sierra Leone's civil war, they looked at 200 villages, half of which were randomly chosen to participate in the truth-and-reconciliation process. Following up with the 2,300 participants between nine and 31 months after the public airings, the researchers made an interesting discovery. 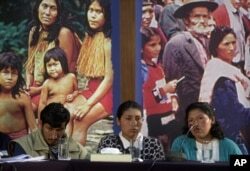 FILE - Silvia Flores, right, testifies while Celestina Flores, center, and her husband listen, during a public hearing of Peru's Truth and Reconciliation Commission in Lima, Sept. 10, 2002. The commission was hearing testimony from witnesses of atrocities committed by both sides in the 1980s and 1990s during the government's battle with Shining Path insurgents.. In the journal Science, the researchers report they found a 36 percent higher rate of post-traumatic stress in program villages, compared with an 8 percent increase in the communities where civilians did not face their tormentors. In Sierra Leone, as elsewhere, reconciliation ceremonies are not cheap. A two-day event can cost about $200 to organize, an expensive indulgence for many countries torn by local rebellions. And that does not begin to address the psychological cost of the public forums. While nobody thinks wartime atrocities should be swept under the rug, Dube suggests there may be a way to ease the emotional pain of the truth-and-reconciliation face-to-face meetings. The authors conclude that their first-of-its-kind study highlights the need to restructure the truth-and-reconciliation process to help civilians traumatized by revisiting wartime experiences.